Well I have been meaning to start a blog for quite some time now so its really great to finally get this going. Very excited now about my trip as things are moving along and slowly getting organised. So far I have paid my permit for the South Col route on Everest, organised Mountain Tribes Trekking in Nepal to do all my logisitics for the trip, bought my plane ticket, starting to get my gear ready and training like crazy. My plan is to arrive in Kathmandu on the 29th of March and head into the Khumbu flying into Lukla. From there I will trek up to Gokyo, hike up Gokyo Ri and then head into Lobuche East basecamp from Cho La pass. To climb Lobuche before going to Everest basecamp will greatly aid in my acclimatisation process as it is 6119 mts in altitude. This will hopefully mean I will trek through the icefall at Everest alot less times which will be much safer. I am going to have a climbing sherpa with me for my entire trip and still don't know who this will be! Babu from Mountain Tribes is organising this climber for me and I just asked for someone with more than one Everest summit under their belt.We will then continue to Everest basecamp where I will have my own little camp with a cook tent and not much else. From here my climbing sherpa and I will start our ascent up the mountain, carrying gear up and tents to each camp acclimatising before making our summit attempt. I guess this will be around the end of May when we are acclimatised enough and have good weather. I just love the spelling! Brings back some great memories. In 2007 my climbing partner Jason and I acclimatised trekking in the Khumbu region of Nepal before heading to Cho Oyu basecamp in Tibet. We stocked camp 1 together and headed up the mountain a little higher before returning to basecamp to get ready for our summit bid. Sadly Jason had got frostnip on eight of his toes at camp 1 and revealed the damage the afternoon before we were to head up the mountain. It would have been a really bad decision to climb up so high with these blisters on his feet so he chose to remain at basecamp while I went up the mountain on my own. I had the good fortune of being able to sleep in my friends tents at the higher camps. He was guiding and the tents were set up but the clients had not made it to them yet. This was such a great help as it meant I didnt have to carry so much gear. I also paid his sherpas to carry some of my gear to high camp at 7500mts so I would have a much better shot at the summit the next morning. This certainly paid off because overnight we had a storm which left alot of fresh snow on the route. The only other climbers heading to the summit that day were an italian guide with his client. They turned around just under the yellow band which is the first cliff at the start of the real climbing. I was a bit sad that I would have to go alone and plug all the steps in the new snow myself but got on with the job anyway. Some of the fixed ropes were buried under the snow so this made things slower. Just before I reached the summit plateau I dumped my pack and just carried my camera, some gel shots and a water bottle in my downsuit as I was so exhausted I feared I wouldn't make it. Once again I was extremely fortunate to follow a crampon trail to the summit along this plateau and not get lost. The wind had actually kept this trail clear but swept all the snow down the steeper part of the route. The plateau is about a kilometer long and seems so flat it is really hard to tell where the summit actually is. I just knew that if I saw Everest I would be at the top as I was climbing up the opposite side of the mountain to Everest. I remember breathing so hard and fast just keep from passing out because the air is so thin. I arrived at the summit at 3pm after 10 hours of climbing and it was absolutely amazing. I felt I worked so hard to get there not just physically but also mentally and to save the money to get there in the first place. The summit of Cho Oyu May 9, 2007 with Everest in the background. Not such a great photo but its the best I could do taking it myself! After 3 hours downclimbing and rapelling I returned to high camp. I slept a solid 12 hours before waking up and packing my things to return to basecamp. I was very slow on the descent as I was extremely tired, had a heavy pack and didn't want to make any mistakes as this was when an accident is most likely to happen. It took eight days from when I left the basecamp to summit the mountain and return. 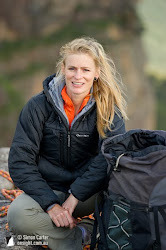 It was such a great feeling and I was the second Australian female to climb it without the use of supplementary oxygen. Sue Fear was the first who tragically died on Manaslu in 2006 after successfully summiting five 8000 mt mountains. I had great dreams after this trip to attempt more 8000 mt mountains and was planning to go to Shishapangma the year after. Unfortunately however the Chinese government weren't giving out permits and I didn't have enough money to climb one in Nepal as it is much more expensive. Instead I organised and guided two trips back to Nepal with clients. Here is a photo of my client Lorne and my cook Pasang on the summit of Mera Peak 6476mt. Pasang was really keen to climb a mountain and it was his first time. He did it in his jeans! I then decided that I wanted to climb Everest next because its the highest. The last couple of years I have not had the finances to do this trip. I want to climb it from Nepal. Even though it is more expensive I don't particularly want to support the Chinese government in Tibet. I also have some friends guiding the Nepal side so it will be more fun and social for me. To date I have no financial sponsorship or equipment sponsorship but I am currently working on it and hope to have some soon.